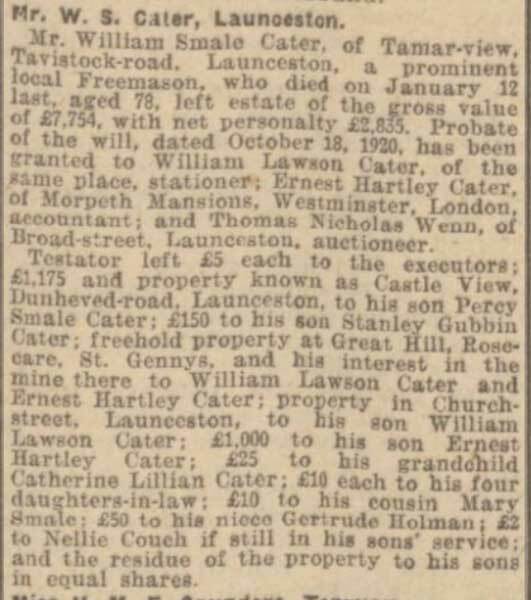 William Smale Cater | Launceston Then! William was born to William and Elizabeth Cater in 1852 at High Street, Launceston. His father, William senior, who came from Huntingdon, was a boot and shoe maker. William was educated at Horwell Grammar School under Mr. Richard Reed. In early life he sought his fortune in London, and was for some years employed with Messrs. Simpkin and Marshall, a London firm of publishers. In the 1871 census is found living in a boarding house run by Mrs. Anne Cannon in Paddington and he was working as a Law stationer. Whilst in London he married Martha Gubbin of Boyton in 1878. Together they had four sons. Percy, Stanley, William and Ernest. By 1881 he had returned to Launceston and was living in Westgate Street running a printing company with a Mr. Eveleigh, taking over the business in Westgate Street which had been conducted by Messrs Cory. 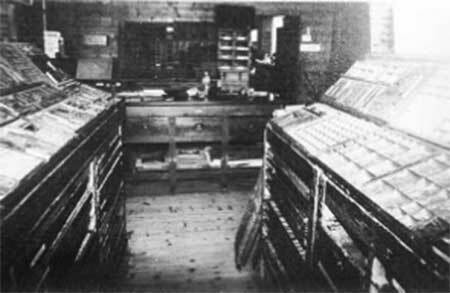 W. S. Cater and Co., at their Machine Printing works, printed the first copy of the newly named ‘Cornish and Devon Post’ and astute enough to see their opportunity and to plan accordingly, the producers of the new paper, which as they had hoped, ‘sold like hot cakes,’ were able to announce with pride ‘arrangements are completed for printing the paper by Steam Power.’ Prior to that, the machine was turned by relays of men! With eight pages and still priced at 1d. it still gave plenty of national and international news. But although William did help to bring about the first publication of ‘The Cornish and Devon,’ it was not long before he severed his connection with the paper, and in 1883 he established a business in Church Street and also a printing business in Race Hill (below left), from which he produced ‘The Penny Marvel,’ an annual publication which was well worthy of its title apparently. William Smale Cater has another claim to fame as at the age of 18, he, with Dr. Wise and another local man, was the first to ride out of Launceston on a penny-farthing bicycle. He was also very fond of music, and in his youth gave performances. William was also a keen sportsman, and followed the local football and cricket teams. He was a keen swimmer and right up to his death would find the time to go sea bathing. Sea-fishing was another indulgence of his. In the days of the Volunteer Force he was an ardent member of the local Corps and was a good shot, having won many prizes at Wimbledon. William was closely associated with the Working Lad’s Institute, and in 1891, along with James Treleaven junior, help start what was the P.S.A. Later to become the Brotherhood, serving nearly 40 years as its treasurer. 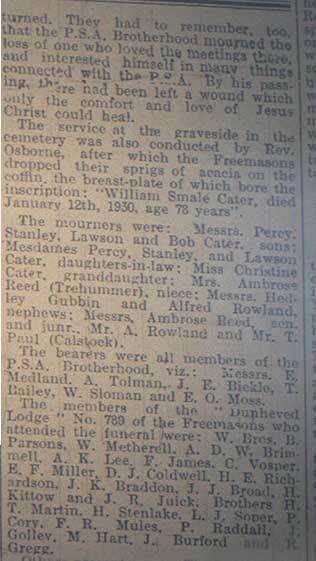 He was also a member of the Dunheved Lodge of Freemansons, serving as Worshipful Master in 1892. For several years he had been the Manager of the Launceston Council School (Windmill School). He and his family were members of the Congregational Church. 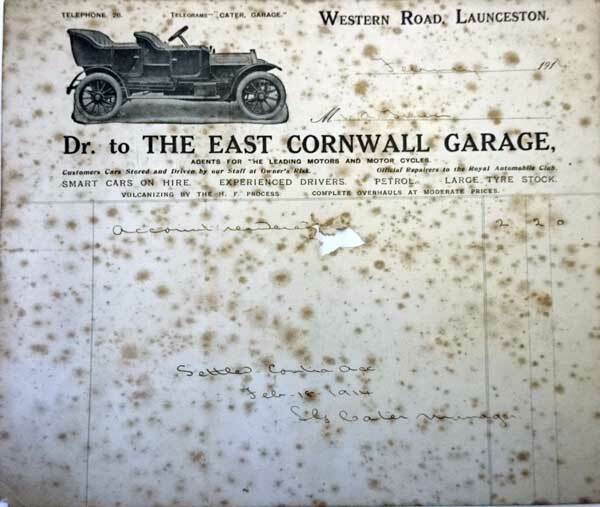 William also set up a motor agents business operating as East Cornwall Garage in Western Road, Launceston. In his later life he became abit of a property developer with sites all around the area including Polzeath. 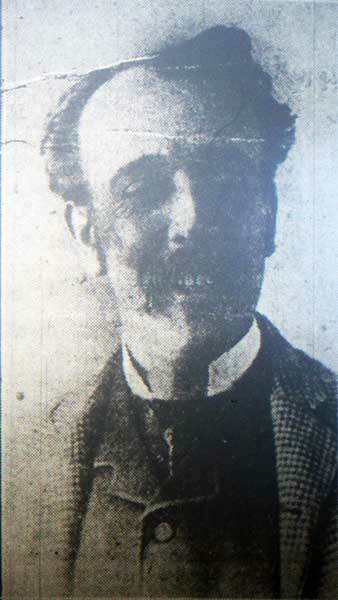 William died on January 12th, 1930 at his home at Tamar View, Tavistock Road, Launceston. The funeral service was held at the Congregational Chapel in Castle Street, being conducted by Rev. R. H. Osborne (United Methodist Minister). He was interred at Launceston Cemetery.